The formation of this club (Academy) was a dream come true,and since the club has grown stronger despite some setback,we manage to put our heads together in contributing to form this club.The name Dasac was originally from African Sports Club founded way back in 1998. Dasac was formed to provide youth players with the intention of developing soccer skills, and making their way in realising their goals, in motivating them in order to play under København Boldspil Union.They are given the opportunity to play soccer all throughout the year,indoors and outdoors,and participating in Danish tournaments. 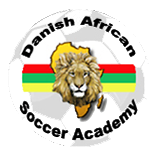 The academy is open to all youth and senior players, regardless of thier ethnicity background,dasac plan to make it easier for the ethnic and danish youth to play soccer together. We think that not all players will end up as super stars or have succesfull career,but our ideas era not just playing football,here they can work together learning the basic things in life, designed to give them an indication of what lies ahead in real world when they become top players or leaders.Hamid Juniour the sports project leader and the team commitee members is responsible for these programes. Dasac as a whole will or can achieve its goal in emplimenting these dreams. Our vision is to be the best players "PRODUCER"worldwide and in Scandinavia- and to help those with TALENT to focus more on becoming better players. DASAC intedents to achieve a higher position every year during the next 3-5 years both in Europe and Africa.